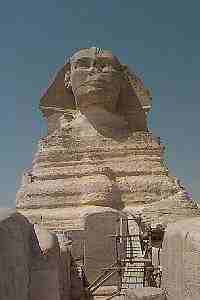 No other country not even China or India has such a long unbroken history as Egypt. Nearly 3,000 years before the birth of Christ, the Egyptians had reached a high stage of civilization. They lived under an orderly government; they carried on commerce in ships; they built great stone structures; and, most important of all, they had acquired the art of writing. Because they lived so long ago, the Egyptian people had to find out for themselves how to do many things that are easily done today. They adopted some inventions of the Sumerians but made more extensive use of them. In the Nile Valley the early development of the arts and crafts that formed the foundation of Western civilization can be traced. The traveler along the Nile sees many majestic monuments that reveal the achievements of ancient Egypt. Most of these monuments are tombs and temples. The ancient Egyptians were very religious. Tutankhamun (1343-1325 BC), Egyptian pharaoh of the 18th Dynasty, the son-in-law of Pharaoh Akhenaton, whom he succeeded at age nine. He ruled as pharaoh until his death at about age 18. In 1922 British archaeologists Howard Carter and Lord Carnarvon unearthed fabulous treasures from his tomb.